Whilst I was very tempted to do X is for X-Ray just so I could show you all the skulls and skeletons that I love in jewellery; I decided to showcase X by Trollbeads as I think it deserves a bit of love and having been around from the launch of this brand I can't resist the opportunity to spread the word and give you a rest from the beads! Here is the original introduction video describing what X by Trollbeads is, most of my regular readers will have seen this before, but if you're new to Curling Stones or X by Trollbeads it's a very good starting point. I also found some of the videos by the Designers and thought I'd pick out my favourite video from the bunch, I don't have any of Kristian's designs but I love the way he describes his approach and sense of achievement. The video is very short and worth watching just to see the sheer amount of detail he achieves in one of his designs! I find X very versatile and will often stack it with other bracelets and brands as well as wearing it by itself. What jewellery do you have that goes with everything? Hello! I'm popping in from the a-z. What creative jewelry! I admire people who design and create jewelry....seems difficult to me. I did expect to see Legos though! I like your 'about me' explaining the name of your blog...not to expect a blog around curling or Legos. :-) My blog is Adventures in the Ballpark, and I write nothing about baseball, so I get it! HA! We're almost done with the a-z! What will we write about then?!?! I have overlapping projects at the moment as my next series of blog posts has content that already needs to be started! Although once the new project "live" element has finished I do plan on getting some sleep as between the day job and blogging 2 projects I feel a tad stretched right now - although I have to stress in a good way as it's very exciting! I'm blogging Hull Fashion Week which started this Saturday, so I have a head full of ideas and no time to write them just yet, I forsee a bit of candle burning at both ends! 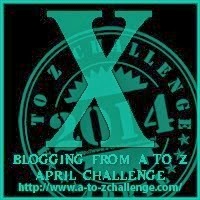 Loved your X post this morning, lovely way for me to start my blog hop on a Monday morning! You made me giggle with "hence I keep buying more beads!" X is so light to wear, that it's one of the bracelets I can wear for work without causing any typing/clattering bracelet issues. I definitely want more bronze for mine and have a need for plain links in silver and bronze as well a few more locks as I have enough to do 3 bracelets now. I do love the look of X without the lock, and that's how I was predominantly wearing it for a long time. However, essentially, in some areas, erm, I'm a bit lazy and once I'd got the bronze one and realised how much quicker it is I'm coverted... as if you're stacking then it's far easier to do up several! I've got the RBF Aladin's Lamp coming in Brass so I can't wait to see how that might compliment the X bronze. I do hope RBF come up with more Brass, it's a direction I'd like to take as I prefer Bronze/Brass over Gold charms in looks and not just because of the price difference! Glad to have been of help, if you need any assistance with them or want to ask any questions please feel free! How are you finding the challenge? I usually only post once or twice a week so the change to daily has been quite the challenge for me! Thanks for stopping by and commenting, it's always great to "meet" people!